Butterfly Bush ‘Pink Delight’ is a popular variety of butterfly bush. This variety will grow up to four meters in height and spread over a period of five to ten years. ‘Pink Delight’ can grow in loam, sand, chalk and clay soil types, as long as the soil is well drained and prefers full to partial sun, making it suitable for hedging in most gardens. When pruned appropriately, buddleja ‘Pink Delight’ remains a smallish shrub with a nice bushy habit and spires of shocking pink blooms atop its narrow, greyish leaves. 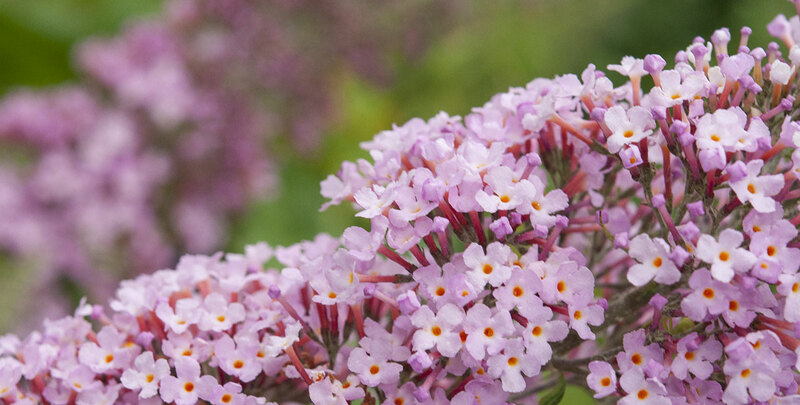 These flowers are the main focal point of the butterfly bush, and proper pruning will encourage growth. This buddleja can be pruned back severely in the spring, and ideally deadheaded regularly. The butterfly bush is named so with good reason – the beautiful, brightly coloured blossoms are intensely fragrant and will draw not only butterflies, but also bees and other pollinating insects into your garden. Requiring no more than moderate upkeep, buddleja ‘Pink Delight’ is an undemanding hedge plant that will reward minimal effort with maximum effect, offering more than just visual interest. The butterfly bush is highly suitable as a border plant and as a backdrop of many types of perennial. ‘Pink Delights’ namesake flowers with orange eyes will unfold in late summer, and create a stunning colour palette along with its silvery grey leaves. This foliage will itself turn a deep yellow during the autumn after the flowers fade, keeping a certain amount of colour despite the season. Buddleja ‘Pink Delight’ is a simply stunning addition to any garden.